Copies can be ordered internationally via the Mandala Book Point website at US$20.87 or purchased at Mandala Book Point on Kantipath or any other reputable Kathmandu bookstore for 1095 Nepalese rupees. For more information on the book's contents, see the YouTube recording of the talk given by the author for the Social Science Baha in Kathmandu on 30 March 2016. The accompanying PowerPoint can be downloaded in two parts from the NEPALI page on this site by scrolling down to the `Moti Lal Singh' section. On 25 May 1850 Jang Bahadur Kunwar Rana, Prime Minister of Nepal and Ambassador to the Court of Queen Victoria, landed at Southampton. ‘It seemed as if we were in a dream, or as if this was the heaven where virtuous men are said to go after death,’ was how one of Jang’s party described his first reaction. 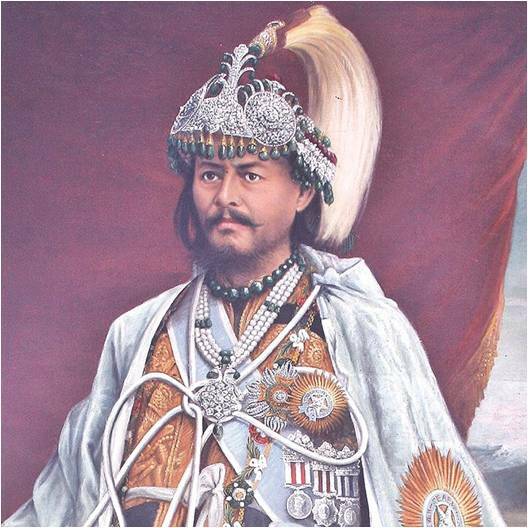 This courtier’s account of the whole episode has been translated into English for the first time and is presented alongside the British and French press reports of their visitors’ progress ‘lavishing diamonds and gold, enshrined in a halo of oriental mystery.’ Jang Bahadur in Europe also looks at the background to the mission, including the changing pattern of Nepal’s relations with British India from 1769 to 1850, and Jang’s own rise to power amidst the intrigue and violence of the 1840s. The second edition of the book, released to coincide with the 200th anniversary of permanent diplomatic relations between Nepal and Britain, includes the English-language account of the visit written, with help from a ghost-writer, by Moti Lal Singh, the Nepali crossing sweeper taken into Jang’s employment after a chance encounter in London. John Whelpton taught English in Birgunj and Kathmandu at the Shri Thakur Ram and Amrit Science campuses of Tribhuvan University from 1972 to 1974 and has since returned regularly to Nepal for research on history and politics. His other publications include Kings, Soldiers and Priests (Manohar, 1990), A History of Nepal (Cambridge University Press, 2005) and (with David Gellner and Joanna Pfaff-Czarnecka) Nationalism and Ethnicity in Nepal (Vajra Books, 2008). He lives with his wife and daughter in Hong Kong, where he now teaches Latin and is a research associate of the Chinese University of Hong Kong. May 1, 2016- There are no reasons to feel nostalgic about a Nepali iron ruler’s visit to any place in history, nor are our public memories associated with such rulers’ dreams. But when I saw the port of Marseilles for the first time in 2000, I remembered Jang Bahadur Rana’s visit to Europe in 1850-51 and his emotional outpouring of his love for Europe when he was about to board a return ship. 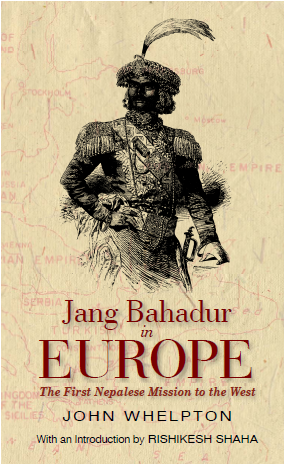 This reference can be found in John Whelpton’s book Jang Bahadur in Europe: The First Nepalese Mission to the West. Enamoured of London in his three-week visit, Jang began saying he would have loved to stay behind as resident ambassador if he had enough money. That transformation of a person who had established a family rule after orchestrating the Kot massacre in 1846, who, we can guess, must have been deeply damaged by the rough and tumble of his power-savvy career, and who was clever enough to convince the British to receive him as the raja of a country in South Asia—something denied to his predecessors—is a remarkable subject of study in its own right. When I read the second edition of Whelpton’s book with coloured photographs and more commentaries published a few days ago by Mandala Book Point in Kathmandu, I was struck by a number of issues and narratives. As before, I turned to that section in which, to the chagrin of his brothers, Jang expresses his reluctance to leave Europe. The desperate brothers had to ask Cavenagh to persuade him to return. Whelpton’s commentary speaks volumes about the mind of a power-mongering ruler. “When he had finally set sail from Marseilles on board HMS Growler, Jang wrote a sort of poetic farewell to Europe, in which he stated that he should look upon his visit as a dream which could never recur…He agreed his idea was impossible but said he would still like to have some of his children educated in Britain”. This archetype of ‘foreign’ love that Nepali rulers of different hues, denominations and eras have carried is perhaps a subject that we have explored very little. The idea of sending one’s children abroad for better education and, if things go as expected, even settling there oneself, has perhaps become normal. But this is not exclusive to the Nepali ruling class. Postcolonial studies have revealed more of this psyche. Whelpton has used one other reference to the construction of a road linking Nepal to the British Raj. Jang did not want a road linking Nepal to the British India for fear of going down in history ‘as the author of his own country’s destruction’, because he believed that would be tantamount to inviting Britain to take over Nepal. A different historical incident of a dictator’s psyche about constructing roads can be recalled here. King Mahendra built the Kathmandu-Kodari road in the sixties but he had a different psyche about going down in history by building a road linking a big power to Nepal. It is interesting to recall this road imagery in relation to a dictator’s psyche of inviting a big power to take over Nepal by building a road. In the context of sorting out difficulties in the reopening the Kathmandu-Kodari highway following the damage caused by last year’s earthquake, it becomes even more interesting. However, King Mahendra, answering a journalist’s query, had said, he did not believe communism would come to Nepal by riding a car. Having said that, Whelpton’s Jang reveals an entirely different context of geo-political relationship including the narratives of power. Though this translated text, as Whelpton says, is not much of an authentic and serious material, it constitutes an important aspect of the narrative of history that speaks, among other things, about the quirks and unease, appeasement and containment of relationships among nations, especially in relation to the burgeoning colonial power. Out of the five or so different versions, Whelpton uses the 1957 version that Kamal Mani Dixit published because I had made this available to him in London towards the end of 1978 when I was studying at Edinburgh University. To Whelpton, perhaps this travelogue became a metonymy to look into the Nepali history of that period because he embarked upon the study of Jang and his times for his PhD research following this episode. We got this text published in Kathmandu by Sahayogi Press in 1983 after he started his PhD research. A rather meandering introduction to this book written by the late historian and statesman Rishikesh Shah and Whelpton’s own original and insightful interpretation of the history evoked by Jang and his mission on the basis of this text and the study of the British press reporting then convince us that this moment of Nepali historiography is usable even today if we see it comparatively. The late Ernest Gellner says in his review of the first edition of this book under the title “Strategies of survival” in the Times Literary Supplement of December 23, 1983, “The book highlights the manner and context in which Jang Bahadur excogitated and decided on his general policy” that he “implemented it conspicuously seven years later”. We used Whelpton’s translated text of the travelogue with Gellner’s review in the MPhil course of Nepal studies prepared for English students; Jang’s confidence and style of performance were the principal focus in the academic discussions. Recently, in the context of observing the bi-centenary of Nepal-Britain relationship, the evocation of a period of history falls in place. Metaphorically, John Whelpton is doing Jang Bahadur and I am doing Shakespeare in this context. Whelpton’s recent speech given at the Royal Society in London and at Social Science Baha organised by Mandala Book Point has revived the discussion of the Jang narrative. Indeed, the Jang discourse evoked by such discussions has some interesting academic significance.